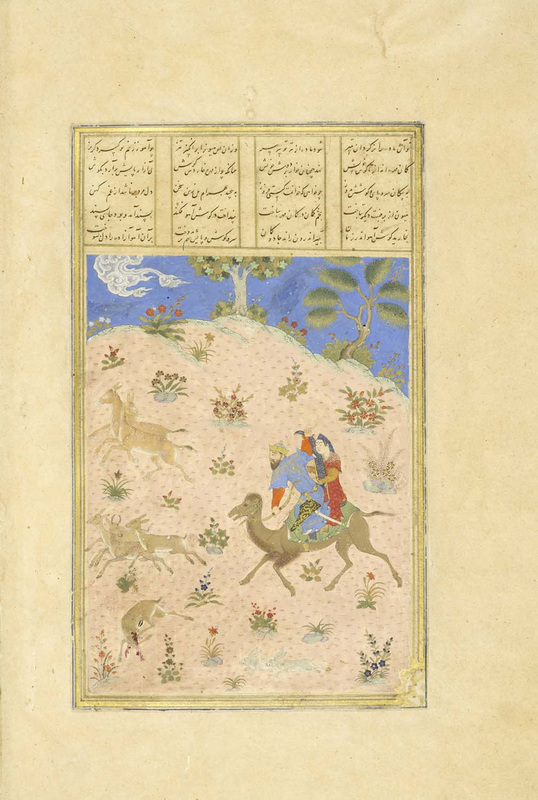 This image refers to the account of young prince Bahram Gur taking the slave girl and harpist Azadah hunting. She asks him to complete a series of impossible tasks, such as shooting a gazelle through both the foot and ear. To her great surprise, Bahram Gur completes all of the tasks. Azadah weeps, believing that only a spirit of evil could shoot so. He flings her from the camel and tramples her, saying that her challenge has put him at risk of dishonor. This story was commonly depicted at the time this manuscript was produced. The figures here are notable for their richly colored robes with intricate gold detailing. Bahram Gur is shown in profile, a perspective that was rarely used at the time. By the position of his body, we can see that he is in mid-action—he stands in his stirrups and leans forward, and having just released an arrow, his right hand is flung back with the index finger extended. A fine line of pricked pinholes outlines the entire camel, even cutting through the legs of the riders. This is probably the result of someone having made a copy of the camel: the painting would have been placed over another sheet of paper, the holes would have been pricked, and then the second sheet would have been dusted with carbon to reveal the pricked outline. Additionally, damage in the bottom left corner of the painting may be a sign that a seal was obliterated from the page.